LAZY MAKE UP ROUTINE | RAWR BOWS. I don't know about you but I can't stand wearing make up when it's over 30˚C outside. I feel like my face is going to melt and I'm gonna sweat foundation and that's not what I'm buying my foundation for. Hence, I rarely wear make up during the summer time. However, I have to wear make up for some special occasions like when I'm going out for dinner, to some party or I have plans that are on the fancier side. Even then, I try to keep my make up as minimal as possible and just enough to make myself put together and presentable. First I use NYX's Above & Beyond concealer to cover my dark circles and some marks or decoloration on my face. 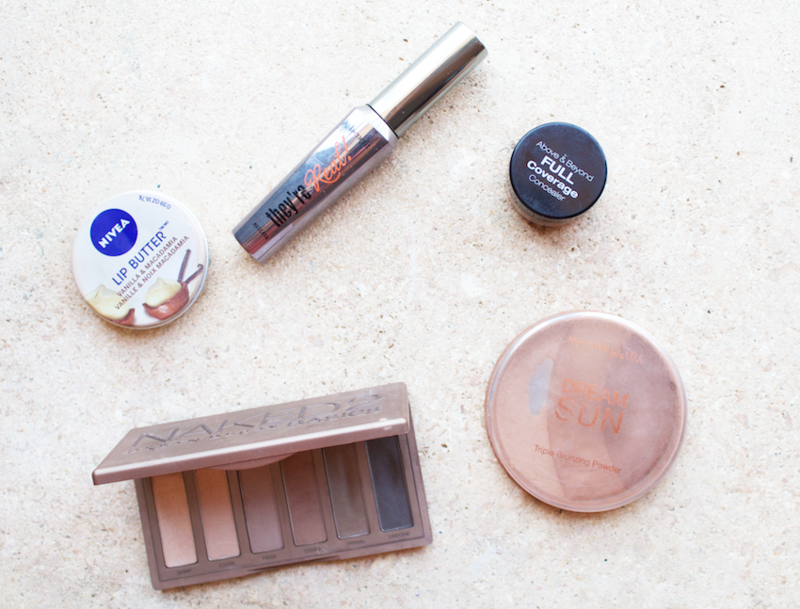 I try not to use a lot because it's quite a heavy concealer. I then use Maybelline's Dream Sun bronzer to add some depth to my face and highlight my cheekbones (or at least I try, I still haven't mastered the art of contouring). To fill in my eyebrows -i.e. a step I can't live without - I use the shade Primal from my Urban Decay's NAKED 2 Basics palette with an angled brush. Depending on my mood, I might use Undone to darken my lash line and give my lashes a fuller look. Regardless of whether I do it or not, I use Benefit's They'Re Real Mascara which is definitely worth the hype. It lengthens and darkens my lashes whilst making them look natural. For my lips, I usually use a lip balm. Right now, my favourite is Nivea's lip butter in Vanilla & Macadamia (even though it kind of makes me hungry...). And this is all I use unless I feel really fancy and decide to go all out with my make up which, let's be honest, it's not really that often. What's your favourite make up product atm?